Are your parched pentunias picky? Do your violets shrink away if the water isn't Perrier? Quench their designer thirst with the Chanel Watering Can, Karl Lagerfeld's latest must-have for today's floral fashionista. This couture can debuted with Chanel's 2013 Cruise collection, presented in none other than the lush gardens of the Palais de Versailles. Achieve royal elegance yourself with this black leather-quilted accessory, complete with Chanel's signature gold chain. Afterward, rake in the compliments with the coordinating garden fork and spade. Empower your flowers. Buy the Chanel Watering Can, and your friends will turn green(thumb) with envy. 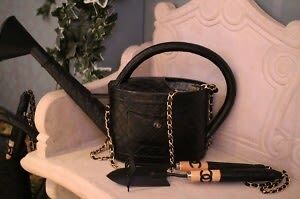 The Chanel Watering Can, available November in Chanel's Cruise collection.